First off, I'll say I liked the first half of the performance a lot more than the second half. But I liked the first half a lot. A wacky troupe of clowns take on WWII while tripping over one another, deflowering mops, and attempting cannibalism. It was very classic slapstick clown comedy, with trashy hobo-esque clowns clattering into each other, attempting to eat their fallen friends, casually murdering one another and taking obscenely loud squelching steps with wet socks. I loved the choreography and how much they tumbled around the stage like sad kittens in a drier. I also really loved the big red noses; I daresay they redeemed clowns for me. The second half was apparently based on Italian street comedy, something I have no prior knowledge of. There was more talking but just as much slapstick. And there were silly wooden masks which I adored, particularly the father's monopoly man style mustachioed mask. The dialogue had some great gems like the doctor professor referring to a bone in his forearm as his labia and a pair of awesome visual puns. It was low-hanging-fruit lowbrow humour and it was certainly supposed to be that – just very silly and very penile-member-in-the-vaginal-canal and family jewels swaying between the legs and blue-green zig-zag penises. I think what I didn't like was Flavio – the over the top effeminate man who comes off as an incredibly vain and foolish trope. I find that whole stereotype in movies and TV to be misogynistic and transphobic and it always turns the “I am enjoying this thing” part of my brain straight down to zero. I don't particularly blame an individual production for it, but it doesn't make me laugh. Either way it definitely was well-produced, well-choreographed, very charming, and had a lot of great moments. 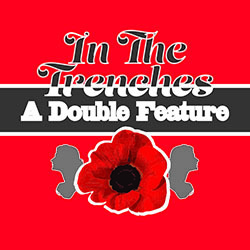 If you love slapstick humour, old men talking about the particulars of their particulars, casual murder, and the dismemberment of people's members, In the Trenches is for you.